You want to make sure it's the natural stuff and cold pressed. The only ingredient should be castor oil and that's it. It's just as thick as mineral oil and provides the same results. I especially love using it in these cold months (I use lighter oils in the warmer months that I will share with you in another post). It keeps the moisture in my skin and leaves it so soft and supple. After I shower, I don't towel dry. With my skin still soaking wet, I apply castor oil mixed with EVOO (and tangerine essential oil for a nice citrusy scent) to my body and let air dry. That's it. From there, if you want to add your favorite lotion or shea butter (mix) on top, go for it. Yeah, your skin will be greasy for a bit but it will absorb it. As Doctor Oz said when he talked about moisturizing your skin, "greasy is good". Because after you've washed your body, you've washed away all the dirt and impurities and you've also washed away all of its natural oils that lubricate and protect it. You want to help your skin recover from this. So say it with me, greasy is good! You can always towel blot some off if you feel you put too much on. The more you use it, you'll have a better gauge of how much to use on your skin. Thanks sooooo much for this!!! Can't wait to try it :D!!! I have a HUGE bottle of castor oil too that I use for everything! It is the best! Yes, Brandiss, I just bought a big 32oz bottle b/c I use it for so much too. I might get another bottle soon though: one for hair and the other for body only. Lol. 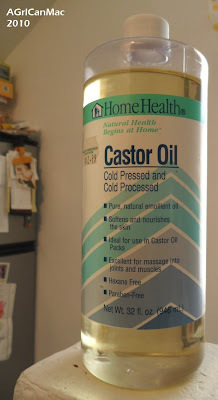 Oooh, this is right on time =) I just purchased my first bottle of castor oil earlier this week for sealing and my scalp. Love it! I will definitely give this a go! Never even thought of using it! Thanks! Castor Oil huh, I never thought of using it on my skin. Makes total sense though, this stuff does make my hair uber soft! I will try it out tonight! I had gotten accustomed to using EVOO on my skin since beginning to transition months ago. But don't use any other essential oils. I will add castor oil to my mix at your suggesion. Thx! i think "greasy is good only works for certain skin types. I have very sensitive skin and am prone to have really, really dry skin also. Greasy for me just leaves me dry in the end. I think for some people a moisturizer that soaks in and actually retains moisture works best. If this is anything like Shea, I'll have to think about it twice. Yes, ladies, it's divine! I hope your skin will love it as much as mine does. I hope you'll like it Ms. Princess! Hey Iman, in my experiences the castor oil doesn't stay greasy. It does sink in and keep the moisture in. Shea butter is thicker than castor oil but if your skin doesn't like heavy oils than this isn't for you. Everyone's skin is different. My god brother has eczema and his skin is extremely sensitive and he luvs shea butter or castor oil for his skin. I'm glad you pay attention to your body and know what will work best for you and what won't. Wow, castor oil has been a big deal as of late, and I think I need to get in on this. Of course my skin is already super soft (don't hate! lol) but I am dying to use some Jamaican Black Castor oil indefinitely!